Sue: Six parts. Oh joy. This had better be ****ing good, Neil. Sue wants to know when Talons was originally broadcast. Sue: I would have been 15 years old, so I was out playing badminton when this was on. And during the last part, I was probably playing golf. Backstage at a Victorian Music Hall, a Chinese magician and his dummy are discussing their latest performance with Gordon Henry Jago, the theatre’s owner and MC. Sue: He’s not a real ventriloquist. They dubbed the dummy in later. Sue: He’s not really Chinese, is he? Oh dear… Why didn’t they give his part to the bloke standing next to him? He’s definitely Chinese. But before she can climb onto her high horse, Sue is distracted by something magical. Sue: That was a beautiful shot of the TARDIS arriving in the fog. Very subtle. I think I’m going to like this one. It looks great. Leela and the Doctor are attacked by a gang of Chinese men. Sue: Enter the Dragon was massive in the 1970s. Me: Enter the Dragon was an X-certificate film. 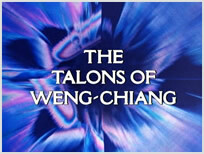 The Talons of Weng-Chiang went out at 6.30pm. With nunchakus and everything! Sue: It’s violent, but we’ve definitely seen worse. 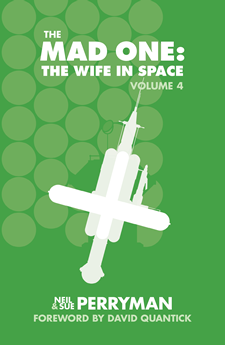 The police turn up and the Doctor tells them he was set upon by “four little men”. Sue: That is technically accurate, I suppose, but it sounds racist. I have a bad feeling about this. On stage, Li H’sen Chang prepares to levitate a woman. Sue: We’ve wandered into The Good Old Days. I always hated that show. It bored me to tears. The Doctor and Leela are taken to a police station. He tells the desk sergeant his abode isn’t fixed. Sue: Yes, his abode is almost always broken. Meanwhile, an old woman is watching the police fish a corpse out of the Thames. Sue: She’s the scariest thing I’ve ever seen in Doctor Who. The old woman declares that it’s enough “to make an ‘orse sick”. Sue: Yeah, and the dead body in the river is upsetting as well. Sue: Okay, this is a lot more complicated than I thought. Now we have anti-racist jibes delivered by an actor who’s yellowed-up. This is going to be tricky. And then Sue has a brainwave. Sue: The Moff should do a Sherlock/Doctor Who crossover for the 50th anniversary. Me: As a Children in Need sketch? Sue: No. As a proper story. It would be great. The Doctor could take the modern Sherlock to Victorian London to solve the case of Jack the Ripper. Only he couldn’t tell anyone about it because time would go wibbly-wobbly and explode, or something like that. How cool would that be? She’ll be writing fan fiction next… And then we discover Chang and Mr Sin have been harvesting victims for quite some time. Sue: They’re a sick and twisted version of The Krankies. Me: Otherwise known as The Krankies. 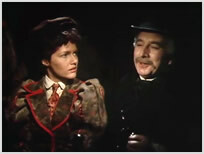 The Doctor and Leela visit the local mortuary, where they assist Professor Litefoot as he carries out an autopsy on the body recovered from the river. Sue: This isn’t for kids. Even when you can’t see anything, your mind fills in all the blanks. Me: This was no boating accident! The Doctor and Leela enter the sewers in search of answers. Sue: It’s very dark. Is it supposed to be this dark? She’s right. It’s probably our television that’s at fault – we lost the remote control several months ago, and there aren’t any manual controls on the actual set itself – because I don’t remember Talons being this dark before. When the giant rat makes its first appearance, Sue can barely see it. Sue: I can’t see a damn thing. It sounds good, though. Actually, perhaps our settings are just fine. Sue: That was a good start. I don’t care if it’s a six-parter if it stays like this. Casey, an Irish stagehand, has been complaining about ghosts, and Jago calls him a “pixillated leprechaun”. Sue: Pixellated? Pixellated? That’s a funny word to use in Victorian times, isn’t it? Is he a time traveller? A time-travelling graphic designer from the future? Me: Pixillated, not pixellated. It means eccentric, or to be led by pixies. I thought this would come up so I did some research for a change. Despite the racist overtones, Sue loves Jago’s turn of phrase. Sue: He’d be excellent on Countdown. Sue: They used to call me Susie Wong. Sue: At school. They called me Susie Wong. Sue: I looked Chinese. Well, that’s what they said. I didn’t understand it either. You’ll have to ask Gary about it. Me: You do realise that they’ll call you Susie Wrong when they don’t agree with one of your scores from now on, don’t you? Sue: Only if you include it on the blog. Chang hypnotises Jago into forgetting anything that will lead the police to his doorstep. Sue: They should remake this story with Derren Brown. And Sherlock. And Matt Smith. Somebody get the Moff on the phone. Chang opens a secret passageway in the theatre floor. Sue: That looked and sounded great. That’s the first time something like that didn’t sound like it was made from polystyrene. The sets are wonderful. Chang confers with his master. Sue: It isn’t, is it? Sue: He looks like Rorschach. We watched Watchmen again last night. Don’t get me started. Me: He looks nothing like Rorschach. Sue: He has the same hat. 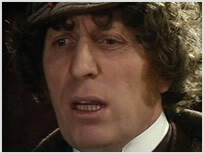 Me: You might as well say Tom Baker looks like Rorschach, then. Sue: But it’s definitely not you-know-who? Me: I’m still counting them, even when you don’t say his name out loud. But no, it isn’t him. I promise. When Time Agents are mentioned, Sue’s ears prick up. Sue: That rings a bell. Me: Captain Jack was a Time Agent. Sue: So there’s a connection to Torchwood? That’s interesting. Okay, so the anniversary special has Derren Brown, Matt Smith, Benedict Cumberbatch and John Barrowman in it. I’d watch it. Litefoot, Leela and the Doctor share a cab. Sue: Leela’s great in this. The story really suits her. Her innocence could be annoying, but it’s funny because she’s anything but innocent. The actress who plays her is excellent. The Doctor jumps out of the cab and disappears into the fog. Sue: This era really lends itself to Doctor Who. The BBC are experts when it comes to this sort of thing. They should have exiled him to Earth in the 1880s. That would have been great. And then she has an even better idea. 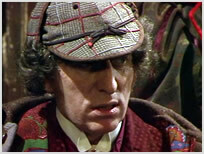 Sue: Tom Baker would have been an excellent Sherlock Holmes. I won’t tell her if you don’t. Sue: He’s really enjoying himself; he’s beaming from ear to ear. The script is excellent. Did Robert Holmes swallow a thesaurus when he wrote this? Professor Litefoot’s housekeeper is called Mrs Hudson. Sue: Does she leave this much food out for him every night? There’s enough on that table to feed the 5,000! Sue: Okay, so you’ve got Derren Brown, Matt Smith, Benedict Cumberbatch, John Barrowman and Michael Ball as the Phantom of the Opera. The anniversary special practically writes itself. 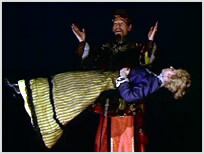 Weng-Chiang swings across the stage on a rope. Sue: The direction is very good. Who is it? Sue: Oh yes, we like Mr Maloney. He’s almost as good as Douglas Camfield. The episode climaxes with Mr Sin advancing on Leela with a knife. Sue: Why is that dummy honking like a pig? Have I missed something? We decide to break our two-episode-a-day rule – it’s a Bank Holiday, the weather is horrendous and there’s nothing on the television except boats. Sue: I love Leela. She doesn’t mess about. Any other companion would have screamed the place down. I know I would. Leela throws herself out of a window. Sue: I couldn’t imagine another companion even considering that. You go, girl! Sue: Did he just call him Sid? The Doctor suggests the ruffians who attacked Litefoot were especially bad because they were Chinese. Sue: Is that racist or is the Doctor taking the piss? It’s not entirely clear… Oh, it’s complicated, isn’t it? Why don’t we just assume that I’ve already taken a mark off this story for its questionable racism, and we’ll leave it at that? The Doctor examines a cabinet that belongs to Litefoot. Sue: Is that a TARDIS? Are you double-bluffing me? The Master doesn’t have a face any more, so he’d probably wear a mask. It all makes sense. Me: That’s three, “Is it the Master?”s in one story, which makes you sound like a rather repetitive old lady. It’s time for Weng-Chiang to feed his pets. Sue: Are you sure it’s a giant rat? It looks like a seal to me. 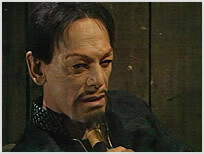 Weng-Chiang sends Chang out for some fresh meat, which he finds coming off the night shift. Sue: Bloody hell. And he wants two of them! He must be a middle-aged bad guy. Leela substitutes herself for one of Chang’s intended victims. Sue: Leela is so brave. This is even worse than the window. The Doctor tracks the monster to its lair in a small boat. Sue: They’re making an effort. They could have cut to the sewers without this, but I’m glad they didn’t, because it looks great. When we return to Weng-Chiang’s lair, Leela looks a little different. Sue: Has he taken her clothes off? 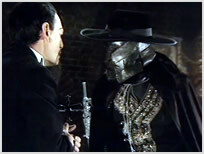 Weng-Chiang sacks his faithful manservant in a fit of pique. Sue: How will he find another henchman? Will he put an ad in the paper? The episode climaxes with Leela being nibbled to death by Fingerbobs. Sue: It’s a shame about the giant mouse. Oh well, you can’t win ‘em all. 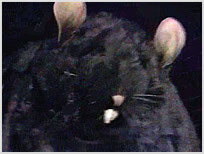 Me: Rats were massive in the 1970s. Literally, in this case. Sue: I know. I walked in on one of your lectures once where you went on about them for ages. Didn’t you show this clip to your students? Me: I did. Along with bits from Doomwatch, The New Avengers, Survivors and During Barty’s Party. You couldn’t move for rats in the 1970s. Sue: I remember the students were laughing their heads off. Me: That wasn’t the reaction I was going for. 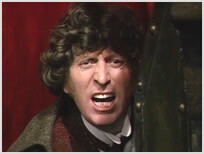 The Doctor shoots the rat, and when Leela returns to Litefoot’s house, she’s given a fresh set of clothes to wear. Leela proceeds to undress in front of her host until Litefoot sends her upstairs to change. Sue: And a million dads all sigh at once. When she returns, the Doctor is momentarily lost for words. Sue: That’s the first time I’ve seen the Doctor look at a companion in a sexual way. And you can’t even see her knees. Chang returns to Chiang (oh how this used to confuse me when I was a child) to beg for his forgiveness. Sue: It’s a lover’s tiff, this. If they had Facebook back then, their relationship would definitely be ‘complicated’. I tell her Dudley Simpson is conducting the orchestra on-screen this week, but she’s far more interested in the audience’s enthusiastic reaction to a rather weak rendition of ‘Daisy Daisy’ to care. Sue: People were very easily pleased back then. 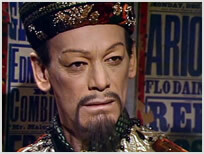 The Doctor becomes part of Chang’s act. Back at Litefoot’s house, a policeman suffers an axe between the shoulder blades. While Mr Sin stirs in Litefoot’s laundry basket. Sue: Ooh, I thought he was dead… Is he a robot? When Chang opens his magical box, Casey falls out of it, as dead as a dodo. Sue: They killed the Irish Billy Mitchell! 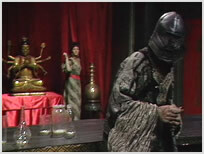 The Doctor and Leela find Chang moping about in Weng-Chiang’s laboratory, his master having already done a runner. Chang heads to the sewers to meet his ancestors. Sue: I didn’t know Chang was related to the mouse. Chang’s screams echo down the tunnels. Sue: I’ll miss Chang. The person who played him was a great actor, even if casting him was a bit dodgy. Jago spots a business opportunity – he’ll charge the punters to take guided tours of the phantom’s lair. Sue: A bob a nob. Like I said, this definitely isn’t for kids. The episode concludes with Weng-Chiang and Mr Sin successfully stealing the time cabinet from Litefoot’s home. Sue: That’s an interesting cliffhanger. The bad guys won. And why is the dummy howling like a wolf? Have I missed something? The Doctor instructs Leela to get Litefoot a stiff drink. In a glass. Sue: I love the My Fair Lady references. It’s funny and sweet. It turns out the Peking Homunculus was a plaything made for the Commissioner of the Icelandic Alliance in the 51st century. Sue: So Iceland is a major player in world affairs in the future? Sue: They sorted out the banks, then? Weng-Chiang installs the time cabinet in his new secret base. Sue: Do we ever see what’s behind his mask? I looked at the toy version you have on your shelf but it doesn’t come off. What she doesn’t realise is that my collectible figurine of Weng-Chiang comes with a detachable head which features his real face. I think one of our cats ate it. 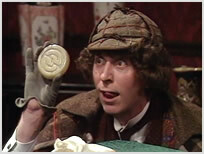 Anyway, it turns out Weng-Chiang left the key to the time cabinet behind when he moved to his new base. This plot point is so preposterous, Sue makes me rewind the DVD so she can make sure it really happened. Sue: That’s just silly. Robert deserves a smack for that. 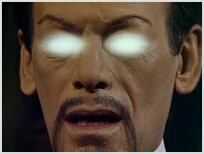 Weng-Chiang is apoplectic with rage. We think. It’s hard to tell because he’s always like this. Anyway, he must be angry because he orders one of his minions to kill himself. Sue: Ooh, he’s cracked a filling and he’s been poisoned at the same time. Poor thing. Litefoot and Jago meet for the first time. Sparks fly. Sue: This could be interesting. Me: Would it surprise you to learn the BBC almost made a Jago and Litefoot spin-off series? Sue: No, I could definitely see that working. Sunday nights in The Onedin Line slot. Yeah, I can see it. Me: It didn’t happen, sadly. 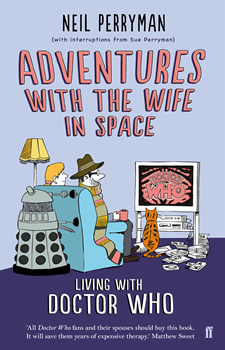 But Big Finish have released quite a few audio adventures featuring the pair of them. Sue: Are the actors still alive, then? In that case, give them cameos in the anniversary special. Is Tom Baker in any of them? Sue: So Tom Baker is doing Big Finish now? Sue: I knew he’d listen to me eventually. I told him to do a Big Finish years ago. The Doctor and Leela find Chang in a local opium den. Sue: They should bump into the real Sherlock Holmes. That would be funny. They find Chang off his head on drugs instead. Sue: Is there anything they haven’t covered in this story? What about child abuse? The injured Chang slides into a drug-induced death. Sue: That was a great death scene, but they had to spoil it with the clichéd, “I can’t get my dying words out even though I just recited 12 pages of script with no problems at all” bit. It’s very annoying. 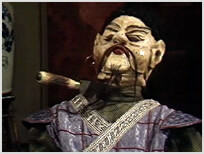 Weng-Chiang’s new digs are situated in the House of the Dragon. Sue: The set is fantastic. They must have thrown plenty of money at this. 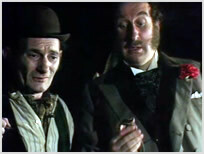 Jago and Litefoot are captured by Chiang’s thugs and imprisoned with two drugged-up 16-year-olds. Sue: Okay, now they’ve definitely covered everything. Jago and Litefoot discuss tactics. Sue: So these two fellas could have been the first Torchwood? Me: It very nearly happened. They squeeze into a dumbwaiter together. Sue: Okay, now it’s definitely a 1970s version of Torchwood. Unfortunately, their escape attempt is foiled almost immediately. Sue: They’re a bit useless. They’ll have to toughen up a bit if they want their own series. Weng-Chiang surprises Leela with a face full of chloroform. 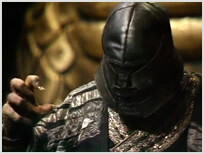 Leela fights back, uncovering Chiang’s face in the process. Sue: I’ve seen worse. The gimp mask was scarier, if I’m honest. 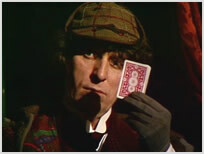 The Doctor calls the Chinese intruders “little surprises”. Sue: There he goes again. Thankfully, her frown doesn’t last very long. Sue: Tom loves this story. You can always tell if Tom likes a story or not, and this is definitely one of his favourites. And then, believe it or not, Sue starts singing along to Dudley Simpson – she doesn’t even know she’s doing it. 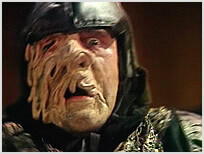 In fact the only aspect of Talons Sue has a problem with is Weng-Chiang, aka the Icelandic war criminal Magnus Greel. Sue: He’s over the top. Although at least I can hear every word he says behind that mask. Leela attacks Greel from behind, but she fails to deliver a fatal blow. Sue: I don’t buy that for a second. Leela would have thrown a knife into the back of his head from 100 yards away. She could have taken him down easily. The Doctor, Jago and Litefoot are locked in the basement, but the Time Lord finds a way out. Sue: I’ve seen this before. Sue: No, in Doctor Who. Maybe golf was rained off that week. I definitely remember this scene because it inspired me and my brother to gas my nana. Sue: It’s true. We had two nanas: skinny nana and fat nana. Fat Nana was all right, but Skinny Nana was horrible. She lived with us for a while and she’d make us go to bed early. We hated her. Anyway, we must have seen this episode because we decided to get rid of her by filling her pillow with gas. Sue: It’s true! There was only one problem – our house was electric. We didn’t have any gas. Me: Thank heavens for small mercies. Sue: It would have been around that time, so I guess Doctor Who must have been responsible. I haven’t thought about that for years. Me: If you’d been successful, you would have been a poster child for Mary Whitehouse. It doesn’t bear thinking about. The gas explodes and Sue jumps out of her skin. Captain Jack was sitting on her knee and the sudden movement made him dig his claws into her thigh. Sue: Are we supposed to feel sorry for the bad guy? Me: Are you mad? He’s a mass murdering war criminal! Sue: I know, but everything seems to go against him. You have to feel a little pity. Unfortunately, the final showdown fails to impress Sue. For every disintegrating chair (“That was clever”), there’s Leela firing a gun into the floor (“Leela would never do that”). Sue: That was frustrating. The ending was rushed. It wasn’t the script’s fault, though. It was the execution. Me: That was Philip Hinchcliffe’s last story. Sue: That’s a pity. He was a good producer. He made Doctor Who a lot more adult and frightening. And there was a lot less CSO, too, which was good. Yeah, he’ll be missed. Probably. Sue: I’ll have to knock some marks off for the casual racism, the mouse, and the shambolic fight scene at the end. But I really enjoyed it. The pacing was about right, and the sets, direction and acting were as good as it gets. The villain was a bit hammy, but you can’t have everything. Later that night, we watched the Lively Arts: Whose Doctor Who documentary together. It would have been rude not to. Sue: It’s a really slow version of Doctor Who Confidential. Some of these clips are almost as long as the episodes. She perks up when they cover the topic of set design, but she nods off in the middle of an interview with an educationalist. She wakes up two minutes from the end and does that classic thing where she pretends she saw the whole thing, even though I was waving my hand in front of her face. Sue: It reminded me of one of those Up documentaries. Ed Stradling should have tracked down the original interviewees to see whether they all turned out like you, or whether their kids watch the programme today. That would have been interesting. He missed a trick there.